Looking for protection from the sun? 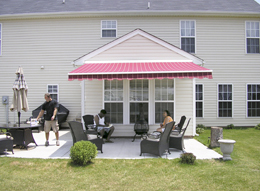 Residential awnings are your answer! Easy cool shade outdoors - and indoors, too! With a retractable awning for your home now you can be outside to enjoy all the fun the warm weather brings without exposure to the direct and harmful UV rays of the sun. Bring shaded comfort to decks, patios, terraces and pool areas. Protect your health and the health of your family. Simply open when you need the shade! Did you know an awning can block out 94% of the sun’s harmful UV rays? We want delighted awning customers! Aware that Aristocrat's products ultimately become part of your home, the Aristocrat team dedicates enormous resources to design and manufacture awnings that are safe and durable. With their daily focus on safety, quality, productivity, training and teamwork, Aristocrat Awnings have earned a reputation for manufacturing excellence throughout the industry. Don’t let the sun chase you off your patio, deck or terrace. Lateral arm retractable awnings mount to your house wall or roof, providing shade when you need it…or sun when you want it. The choice is yours. 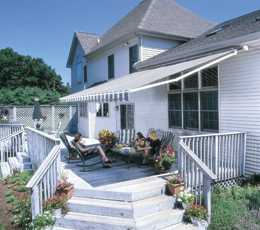 Aristocrat Awnings are best quality, carrying a limited lifetime warranty. They are experts on the design, production, and installation of retractable awnings, demonstrating a 65 year tradition of reliability. 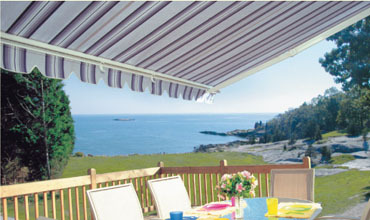 With patio awnings, the blazing sun won’t chase you away from your deck, balcony or patio. You can have sun when you want to take the chill off an early spring day, or when you want to sunbathe - and shade at your fingertips whenever the sun gets too hot to handle. 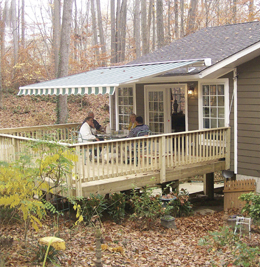 Retractable Awnings can be mounted against you house wall, or on the roof above your patio or deck. 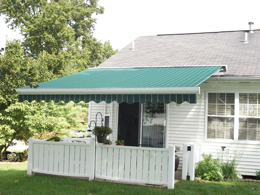 State of the art design features keep the awnings taut and smart looking when fully extended. Retractable awnings can be made in different projections, from 4’ 11” up to 16’ 5” - to full cover even a large patio or deck. And for narrow spaces, near kitchen bump-outs or apartment terraces, the Slim Fit model squeezes a lot of shade into a small space. All patio awnings from Aristocrat feature fabrics from our exclusive collection, or you can choose from hundreds of solids, stripes, or tweeds from various other fabric manufacturers. All Aristocrat retractable patio awnings are custom made to measure, and professionally installed by Suburban Construction. Please enter the number 74912 in the box provided below.